Jeffini the Great is by far THE BEST kids’ birthday party entertainer in Atlanta!!! He made my kids’ birthday party the greatest experience ever. Well worth every penny! - Laura, Covington, GA.
Jeffini's Birthday Party Magic Shows are Uniquely designed for children! 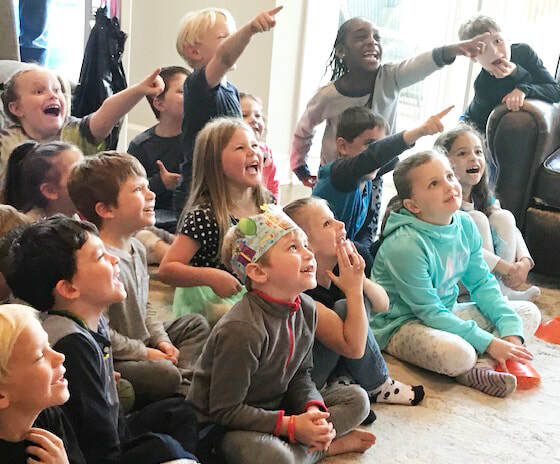 - This party entertainment includes lots of kid participation all through the show - with belly-laughter from beginning to end for kids & adults! YOUR CHILD will BE THE STAR and will magically make Mr. Wiggles the bunny rabbit appear out of nowhere!!! Jeffini can also include Balloon Twisting - twisting fun balloon creations for each boy and girl. ​Terrific for Young AND Old - Jeffini offers shows designed especially for younger kids ages 4 - 7 as well as shows for older children ages 8 - 12. He also offers shows for teens and adults . . . just ask! ​Half hour Hilarious Kids' Magic Show! Mr. Wiggles my live Bunny appears & kids can pet him ... makes great photos! Jeffini twists Balloon Creations for each child following the show ... usually while the children eat their birthday cake. ​Prices listed are for up to 30 children and around 20 adults. For larger groups, please contact me. Jeffini leads 30-45 minutes of fun games before show. You spend time with parents & No kids running wild. After games, you serve your snacks and cake. After the show, kid's pet Mr. Wiggles, receive a balloon animal, say thank you, and head home! Stress-Free Birthday Party & fun for ALL! 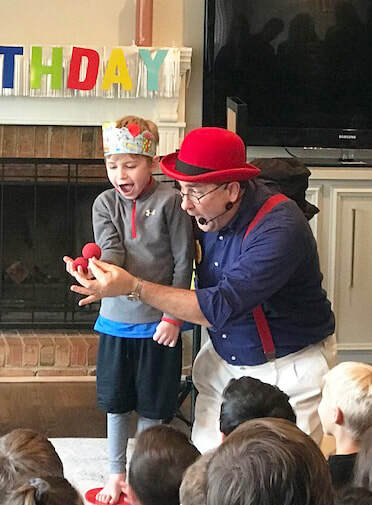 Do you have a group of older kids who think they are too cool for a magic show or balloons... Jeffini can include a 20 minute magic workshop in the show and teach fun tricks they can perform for their family and friends. Jeffini provides all the supplies needed. 2 Great Birthday Presents for your child! A full boxed set of magic tricks perfect for kids ages 7 and up. It also has a booklet teaching 50 additional tricks. These are the same tricks that Jeffini learned when he was an 8 year old boy beginning his magical career. This makes a terrific birthday present for your child and Jeffini would be happy to present it at the end of the show. These kits sell for $39 on Amazon . . . I'm happy to offer it to you at a significant discount. Perfect as a birthday gift for your child OR as party favors for all the guests. The bag includes a full-sized magic wand with a magical gimmick that allows children to truly do 9 magic tricks . . . plus it includes three other fun tricks that are easy to do! ​This calendar shows current bookings for SHOW TIMES. Listed times are for the actual performances and do not reflect travel time, set up time, pack up time and travel to next location. - Saturdays at 10:30, 1:30, 4:30, 7:30. If I can't personally serve you, I have associates who can, so go ahead and still complete the form below OR Call me at 770-375-6486. I know it's long... but the more info you can provide, the easier it is to book the show. If you'd like to just make an inquiry... simply fill in the first few boxes with your name, email and phone. Thanks! Once I receive this form, I'll email you my Performance Agreement for your online signature and an invoice you can use to pay your retainer fee deposit online to hold your date.